Japanese Prime Minister Shinzo Abe struck a conciliatory tone with Russia at an annual rally Thursday to demand the return of small isles claimed by both nations. Speaking at a rally of former residents of four islands seized by Russia in the final days of the World War II, Abe did not explicitly demand sovereignty of the Southern Kuril islands, an emotive issue that has prevented the Asian economic power from signing an official peace treaty with Moscow since the war. 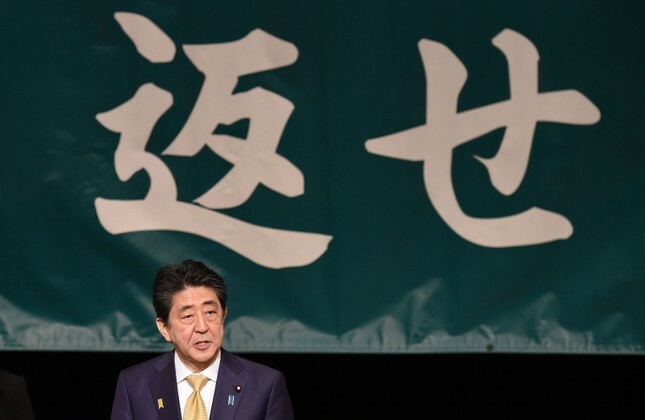 Abe said settling the conflict over what Japan calls its "northern territories" was difficult but necessary. That suggestion angered Russian nationalists, and last month Russian Foreign Minister Sergei Lavrov warned Japan it must recognize the islands as part of Russia as a starting point for talks. "Joint economic projects are in focus. But there is no path forward as far as the return of the islands goes," he told French Press Agency (AFP). "I want to see results."